Moc Chau Highland in April - the month of Ban flowers blooming The town belongs to Lang Son province and far from Ha Noi 200 km nearly. It is the heaven for travelling because of the eco system, also the great sightseeing. If you visit Moc Chauin this month, you have chance to enjoy the white picture of Ban flowers. This is one of the pure and beautiful flowers with the scientific name called Bauhinia variegata that has its origin from South East Asia. 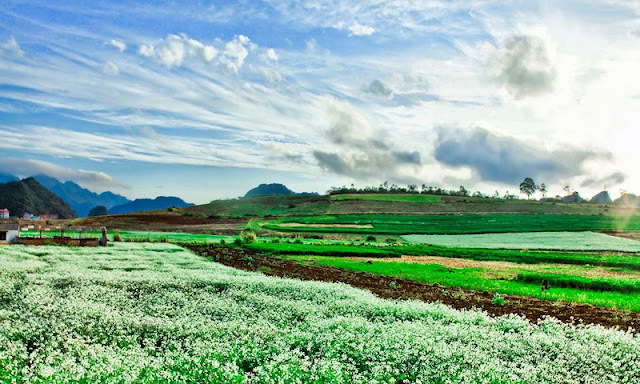 Travelling to Moc Chau highland, tourists will enjoy pure, fresh air in vast highlands with natural beauty, endless grass fields, green tea hills, and visit Hang Doi (also called Son Moc Huong cave). Hang Doi is located in central Moc Chau town, next to Highway 6. Tourists take 240 steps to reach the cave’s gate. Looking from the cave’s gate to the central valley, there are seven mountains like seven gemstones. From the ceiling hang colourful stalactites, many of which nearly touch the ground. In the wall there are stalactites in shapes of elephants, lions, civet, and iguana. In the front of the cave, turning right, tourists will find a stone stalactite in form of a girl who is spinning yarn. Hang Doi is a true natural architectural and artistic work, excellently built by nature. April, Moc Chau is no longer the bitter cold cut meats, mountains are no longer hidden behind the fog, fragile. The year-round mountain ridges blew Traditional white is no longer pink, purple of the flowers, plum blossom, flowering apricot, peach petals fade is not rosy in the spring wind and sun. April, Moc Chau highlighted by life. Across the Steppe is covered by green. Blue color of the forests emerging buds are lean squeezed her soft silk casual on distant mountains. The lush green fields "creepy green grass horizon". Young green rice paddies of the valley filled with warm water. The momentum of the green tea is immense in the spring .... Blue's long quietly lurking, hidden life in plastic, this new experience first rains unleash that inflates. The young tea leaves such as spinach every snap of his reach spread out to welcome sweet rain. 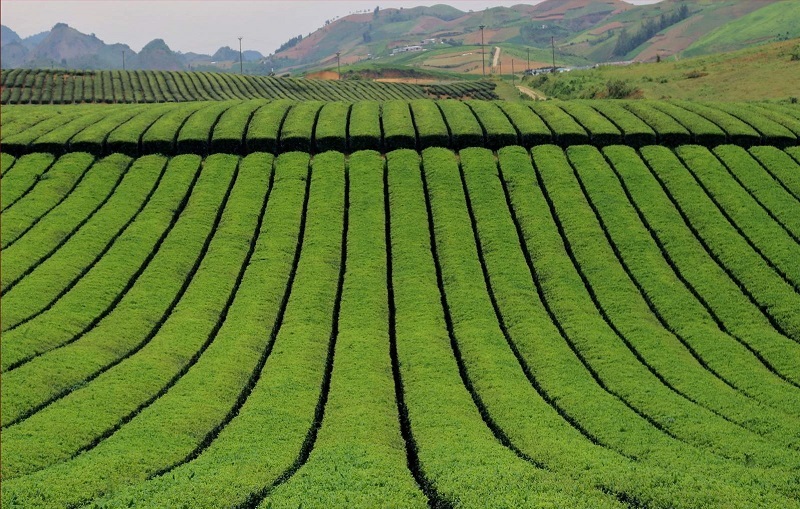 Over the hills and fragrant green tea, white hat flickers of workers picking. One year for harvest beginning in spring tea, tea things difficult to picking but the most fragrant, delicious green tea leaves because this is the first 4 months of convalescence tea, cherished, in his collection of essences valuable from the wind, mist and cool steppe. April, Moc Chau began to harvest peaches, plums, apricots. 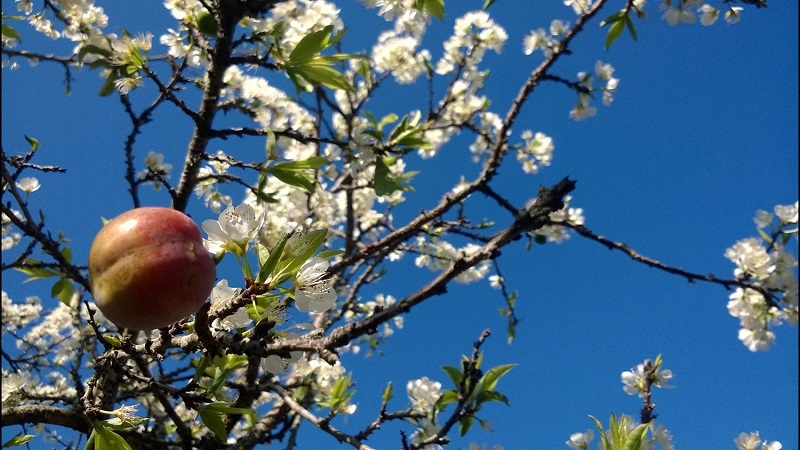 On the plum trees, peach trees the leaves are blue plum, peach, apricot is ripe gradually. Earlier this month people start harvesting apricots, salt of apricots, peach cheeks rosy dreams of the early summer sun as the girls cheeks. Between January, the peach tree method, the island of Taiwan, peach beauty, smooth train began to call birds. Each pair offers crest flying on twitter find ripe fruit groves, every now and then you find you have a song in: shot! riu chiu ... riu chiu ... Last month, plums begin in the main, bustling farmers harvest, each plum purple red white chalk layer remain to be gentle on skin picking or drop down basket. There is nothing more beautiful than the pictures of Mongolian woman dresses red mixed in endless blue of the hill plum where the mountains northwest. Can not use the word “beautiful” to talk about Moc Chau plateau, which may have to be replaced by the word “great”! A peaceful land, green tea hills, white silk ribbons woven from the canola flowers, sweet corn wine and white plum blossoming flowers in the forest …, all these images are imprinted in the memory of any visitor when comes to Moc Chau, it is also one of the tourist attractions in the unique tours in North Vietnam. It is not exaggerative when Moc Chau is considered as a North West girl, friendly, hospitable, pure and rustic with a sincere heart.